FSC certified products are manufactured from FSC certified paper produced by mills which utilize FSC certified fiber. 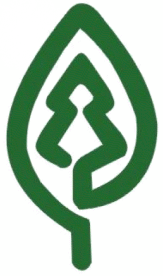 The Forest Stewardship Council (FSC) is an international organization whose mission is to promote responsible management of the world’s forests. FSC is the global benchmark for responsible forest management. The intent of the FSC system is to shift the market to eliminate habitat destruction, water pollution, displacement of indigenous peoples and violence against people and wildlife that may sometimes accompany logging. BENEFITS FSC certified envelopes and products are considered more beneficial for the environment because they are made from certified fibers from well managed forests. Envelopes converted utilizing Green Seal certified papers can be labeled indicating Green Seal certified paper has been used to make the product with the permission of the manufacturer. Minimum requirements for Green Seal certified papers specify that uncoated printing and writing papers shall either : 1) contain at least 30% post-consumer material, or 2) be manufactured without using chlorine or chlorine derivatives. Green Seal is an organization which works with manufacturers, industry sectors, purchasing groups, and governments at all levels to “green” the production and purchasing chain. Products can only become Green Seal certified after rigorous testing and evaluation, including on-site plant visits. BENEFITS Envelopes manufactured utilize a minimum 30% post-consumer waste which helps reduce landfill use and causes the fiber to be given new life as another product. Some of the benefits of using recycled fiber include: reduced tree harvesting, water conservation, and reduced energy use, greenhouse gases, and pollution. Envelopes are made with process chlorine free paper and are certified by the Chlorine Free Products Association (CFPA). PROCESSED CHLORINE FREE (PCF) is reserved for recycled content paper. This includes all recycled fibers used as a feedstock that meet EPA guidelines for recycled or post-consumer content. 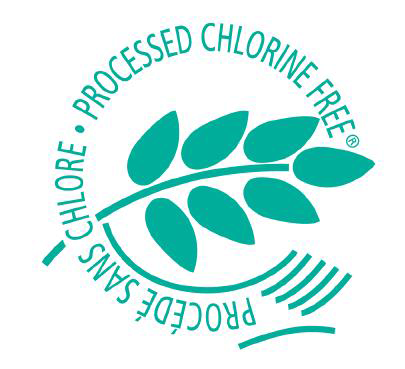 PCF papers have not been rebleached with chlorine containing compounds. A minimum of 30% post-consumer content is required BENEFITS Envelopes manufactured utilizing certified PCF paper are considered less harmful to the environment due to the reduction of environmental impacts associated with chlorine and chlorine compounds which significantly reduce a product’s environment impact. The mission of the Rainforest Alliance is to protect ecosystems and the people and wildlife that depend on them by transforming land-use practices, business practices and consumer behavior. Companies, cooperatives and landowners that participate in RA programs meet rigorous standards that conserve biodiversity and provide sustainable livelihoods. The Rainforest Alliance works with people whose livelihoods depend on the land, helping them take a new approach to the way they grow food, harvest wood and host travelers. RA involves businesses and consumers worldwide in an effort to bring responsibly produced goods and services to a global marketplace where the demand for sustainability is growing steadily. RA sets standards for sustainability that conserve wildlife and wildlands and promote the well-being of workers and their communities. 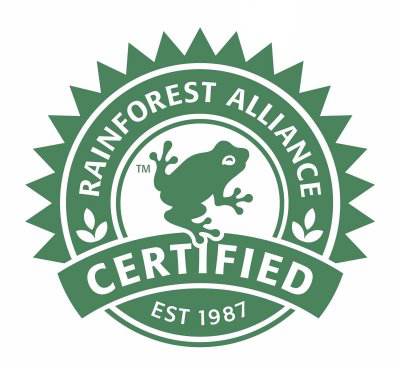 Farms and forestry enterprises that meet their comprehensive criteria receive the Rainforest Alliance certification seal. BENEFITS FSC certified envelopes and products are considered more beneficial for the environment because they are made of certified fibers from well managed forests. Wind Power products are Green-e certified which indicates that the product is made with electricity generated from certified wind power to the standards set by the Center for Resource Solutions. 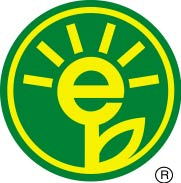 The Green-e Renewable Electricity Certification Program is administered by the not-for-profit Center for Resource Solutions. Green-e provides an easy way for consumers to quickly identify environmentally superior products made from renewable sources of electricity. Wind energy is the fastest growing source of electricity. BENEFITS Green-e certified wind power envelopes and products are considered more beneficial for the environment because they are made from a clean, renewable energy source. Wind energy serves to avoid the release from conventional electricity generation carbon dioxide, the leading greenhouse gas. Envelopes printed utilizing lithography can be printed with soy ink as a replacement for conventional oil-based inks. 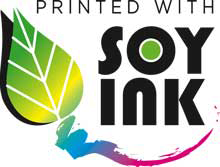 Soy Ink contains non-toxic soybean oil, the same oil which is used in cooking oils, dressings and thousands of other foods and beverages. Soybean oil is extracted from soybeans primarily grown in the United States. The United Soybean Board and the National Soy Ink Information Center states, “Using soy ink helps the nation’s economy by providing a market for a domestic crop while diminishing dependence on foreign resources such as petroleum oil.” Soy inks create rich, vivid color that “pops” off the page. They are low in Volatile Organic Compounds (VOC’s). Soy inks are safe, sustainable, made from a renewable resource and are more easily stripped from paper during the de-inking and recycling process than petroleum inks. BENEFITS Printing with soy ink is considered more beneficial for the environment because the ink is low in Volatile Organic Compounds (VOC’s), safe, sustainable, made from a renewable resource and is more easily stripped from paper during the de-inking and recycling process than petroleum inks. Envelopes qualifying as “recyclable” are made with paper and have no attachments which prevent them from being entered into conventional recycling programs. Any product that is converted is made only from paper and remoistenable seal gum is recyclable. 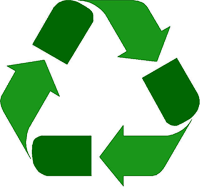 An envelope can only be marked as recyclable if it can be collected, separated or otherwise recovered from the solid waste stream for reuse in the manufacture of another product through an established recycling program. For envelopes that are made of both recyclable and non-recyclable components, the recyclable claim should be adequately qualified to avoid consumer deception about which portions or components of the product or package are recyclable. BENEFITS Envelopes manufactured utilizing only paper are more easily entered into conventional recycling programs. This helps reduce landfill use and causes the fiber to be given new life as another product. Some of the benefits of using recycled fiber include: reduced tree harvesting and water conservation, as well as a reduction in energy, use, greenhouse gases, and pollution. Envelopes are made with paper which contains post-consumer and pre-consumer recycled fiber or both. The type of fiber and percent contribution to the total fiber makeup varies by paper and mill. Post-consumer waste (PCW) fiber is generated from consumer end products that have been separated or diverted from the solid waste stream. Items that make up this type of fiber include office wastepaper, mail and magazines from people’s homes, and used packaging from delivered products. BENEFITS Envelopes manufactured utilizing paper containing post-consumer waste are considered less harmful to the environment due to the reduction of environmental impacts associated with the manufacture of virgin fiber paper. Some of the benefits claimed from the use of paper using PCW waste are: reduced tree harvesting and water conservation, as well as a reduction in energy use, greenhouse gasses, and pollution. SFI certified products are produced from SFI program certified paper produced at mills which utilize fiber certified by the Sustainable Forestry Initiative® program. Fiber coming from this program is certified based on a comprehensive system of principles, objectives, and performance measures developed by professional foresters, conservationists and scientists that combines the perpetual growing and harvesting of trees with the long-term protection of wildlife, plants, soil and water quality. Under the Sustainable Forestry Initiative program, participating companies plant or grow more trees than are harvested each year. Over one million acres are reforested each year under the SFI program. BENEFITS SFI program certified envelopes and products are considered more beneficial for the environment because they are made from sustainable fibers from managed forests which are SFI certified. Simply stated, sustainable forestry is working with nature to ensure the future of the nation’s forests for generations to come. Biodegradable window film is made from either cellulose acetate or polylactic acid commonly referred to as “PLA.” Glassine is also available as a biodegradable window. However, due to its instability and lack of clarity, it is not recommended for any mailing subject to USPS automation equipment. Biodegradable plastic is a degradable plastic in which the degradation must result from the action of naturally occurring microorganisms such as fungi or bacteria. Compostable plastic is a plastic which undergoes biological degradation during composting at a rate consistent with other known compostable materials leaving no visually distinguishable or toxic residues. PLA is a bioplastic which is made from readily renewable resources such as corn, soybeans, potato, etc. Cellulose acetate is made from processed wood pulp. Glassine is a transparent paper made from highly beaten wood pulp. BENEFITS: Windows manufactured from biodegradable material are considered less harmful to the environment because of their ability to break down into mostly water, carbon dioxide and organic matter relatively quickly, by biological means, and disappear into the environment as solids biodegrading into the soil. By contrast, a plastic window will stay intact for many years in a landfill and will not compost. The vast majority of plastic window envelopes end up in the landfill because of the unavailability of recycling programs equipped to deal with the dual materials (paper and plastic) which comprise the makeup of the product. By using biodegradable window material, the entire envelope will degrade. 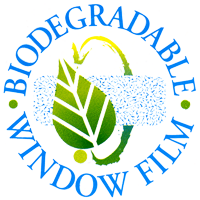 CERTIFICATION MARKS & LOGOS The Biodegradable Window and the Compostable logos are available for any customer purchasing an envelope utilizing any of the biodegradable window films offered. Logo(s) can be printed on the envelope 4-color CMYK, 1-color in a PMS of the customer’s choice, or Black & White. They may be placed in any location on the envelope which the customer designates and must be large enough to be legible. Care should be taken to meet all postal regulations. Logo(s) may be printed on carton and box labels if the product is for resale. If logos are desired, the customer must notify us at time of quotation. When using the EarthFirstTM brand of PLA film, we are required by marketing agreements to incorporate their brand names into the logo. The logo can be printed 4-color, Black & White, or any single PMS color.